Czech (/tʃɛk/; čeština Czech pronunciation: [ˈtʃɛʃcɪna]), historically also Bohemian (/boʊˈhiːmiən, bə-/; lingua Bohemica in Latin), is a West Slavic language of the Czech–Slovak group. Spoken by over 10 million people, it serves as the official language of the Czech Republic. Czech is closely related to Slovak, to the point of mutual intelligibility to a very high degree. Like other Slavic languages, Czech is a fusional language with a rich system of morphology and relatively flexible word order. Its vocabulary has been extensively influenced by Latin and German. The Czech–Slovak group developed within West Slavic in the high medieval period, and the standardization of Czech and Slovak within the Czech–Slovak dialect continuum emerged in the early modern period. In the later 18th to mid-19th century, the modern written standard became codified in the context of the Czech National Revival. The main vernacular, known as Common Czech, is based on the vernacular of Prague, but is now spoken throughout most of the Czech Republic. The Moravian dialects spoken in the eastern part of the country are also classified as Czech, although some of their eastern variants are closer to Slovak. Czech has a moderately-sized phoneme inventory, comprising ten monophthongs, three diphthongs and 25 consonants (divided into "hard", "neutral" and "soft" categories). Words may contain complicated consonant clusters or lack vowels altogether. Czech has a raised alveolar trill, which is not known to occur as a phoneme in any other language, represented by the grapheme ř. Czech uses a simple orthography which phonologists have used as a model. 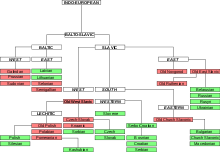 Classification of Czech within the Balto-Slavic branch of the Indo-European language family. Czech and Slovak make up a "Czech–Slovak" subgroup. Czech is a member of the West Slavic sub-branch of the Slavic branch of the Indo-European language family. This branch includes Polish, Kashubian, Upper and Lower Sorbian and Slovak. Slovak is the closest language genetic neighbor of Czech, followed by Polish and Silesian. The West Slavic languages are spoken in Central Europe. Czech is distinguished from other West Slavic languages by a more-restricted distinction between "hard" and "soft" consonants (see Phonology below). The Bible of Kralice was the first complete translation of the Bible into the Czech language from the original languages. Its six volumes were first published between 1579 and 1593. The term "Old Czech" is applied to the period predating the 16th century, with the earliest records of the high medieval period also classified as "early Old Czech", but the term "Medieval Czech" is also used. Around the 7th century, the Slavic expansion reached Central Europe, settling on the eastern fringes of the Frankish Empire. The West Slavic polity of Great Moravia formed by the 9th century. The Christianization of Bohemia took place during the 9th and 10th centuries. The diversification of the Czech-Slovak group within West Slavic began around that time, marked among other things by its ephemeral use of the voiced velar fricative consonant (/ɣ/) and consistent stress on the first syllable. The Bohemian (Czech) language is first recorded in writing in glosses and short notes during the 12th to 13th centuries. Literary works written in Czech appear in the late 13th and early 14th century and administrative documents first appear towards the late 14th century. The first complete Bible translation also dates to this period. Old Czech texts, including poetry and cookbooks, were produced outside the university as well. Literary activity becomes widespread in the early 15th century in the context of the Bohemian Reformation. Jan Hus contributed significantly to the standardization of Czech orthography, advocated for widespread literacy among Czech commoners (particularly in religion) and made early efforts to model written Czech after the spoken language. There was no standardization distinguishing between Czech and Slovak prior to the 15th century. In the 16th century, the division between Czech and Slovak becomes apparent, marking the confessional division between Lutheran Protestants in Slovakia using Czech orthography and Catholics, especially Slovak Jesuits, beginning to use a separate Slovak orthography based on the language of the Trnava region. The publication of the Kralice Bible between 1579 and 1593 (the first complete Czech translation of the Bible from the original languages) became very important for standardization of the Czech language in the following centuries. In 1615, the Bohemian diet tried to declare Czech to be the only official language of the kingdom. After the Bohemian Revolt (of predominantly Protestant aristocracy) which was defeated by the Habsburgs in 1620, the Protestant intellectuals had to leave the country. This emigration together with other consequences of the Thirty Years' War had a negative impact on the further use of the Czech language. In 1627, Czech and German became official languages of the Kingdom of Bohemia and in the 18th century German became dominant in Bohemia and Moravia, especially among the upper classes. Josef Dobrovský, whose writing played a key role in reviving Czech as a written language. The modern standard Czech language originates in standardization efforts of the 18th century. By then the language had developed a literary tradition, and since then it has changed little; journals from that period have no substantial differences from modern standard Czech, and contemporary Czechs can understand them with little difficulty. Changes include the morphological shift of í to ej and é to í (although é survives for some uses) and the merging of í and the former ejí. Sometime before the 18th century, the Czech language abandoned a distinction between phonemic /l/ and /ʎ/ which survives in Slovak. With the beginning of the national revival of the mid-18th century, Czech historians began to emphasize their people's accomplishments from the 15th through the 17th centuries, rebelling against the Counter-Reformation (the Habsburg re-catholization efforts which had denigrated Czech and other non-Latin languages). Czech philologists studied sixteenth-century texts, advocating the return of the language to high culture. This period is known as the Czech National Revival (or Renaissance). During the national revival, in 1809 linguist and historian Josef Dobrovský released a German-language grammar of Old Czech entitled Ausführliches Lehrgebäude der böhmischen Sprache (Comprehensive Doctrine of the Bohemian Language). Dobrovský had intended his book to be descriptive, and did not think Czech had a realistic chance of returning as a major language. However, Josef Jungmann and other revivalists used Dobrovský's book to advocate for a Czech linguistic revival. Changes during this time included spelling reform (notably, í in place of the former j and j in place of g), the use of t (rather than ti) to end infinitive verbs and the non-capitalization of nouns (which had been a late borrowing from German). These changes differentiated Czech from Slovak. Modern scholars disagree about whether the conservative revivalists were motivated by nationalism or considered contemporary spoken Czech unsuitable for formal, widespread use. Adherence to historical patterns was later relaxed and standard Czech adopted a number of features from Common Czech (a widespread, informal register), such as leaving some proper nouns undeclined. This has resulted in a relatively high level of homogeneity among all varieties of the language. A map of the languages of Central and Eastern Europe. Within the Czech Republic, Common Czech is represented by dark yellow (C1) and Moravian dialects by medium yellow (C2) and light green (C3). In 2005 and 2007, Czech was spoken by about 10 million residents of the Czech Republic. A Eurobarometer survey conducted from January to March 2012 found that the first language of 98 percent of Czech citizens was Czech, the third-highest in the European Union (behind Greece and Hungary). Czech, the official language of the Czech Republic (a member of the European Union since 2004), is one of the EU's official languages and the 2012 Eurobarometer survey found that Czech was the foreign language most often used in Slovakia. Economist Jonathan van Parys collected data on language knowledge in Europe for the 2012 European Day of Languages. The five countries with the greatest use of Czech were the Czech Republic (98.77 percent), Slovakia (24.86 percent), Portugal (1.93 percent), Poland (0.98 percent) and Germany (0.47 percent). 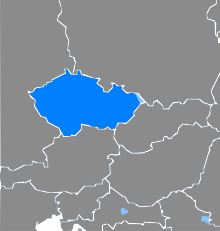 Czech speakers in Slovakia primarily live in cities. Since it is a recognised minority language in Slovakia, Slovak citizens who speak only Czech may communicate with the government in their language to the extent that Slovak speakers in the Czech Republic may do so. Immigration of Czechs from Europe to the United States occurred primarily from 1848 to 1914. Czech is a Less Commonly Taught Language in U.S. schools, and is taught at Czech heritage centers. Large communities of Czech Americans live in the states of Texas, Nebraska and Wisconsin. In the 2000 United States Census, Czech was reported as the most-common language spoken at home (besides English) in Valley, Butler and Saunders Counties, Nebraska and Republic County, Kansas. With the exception of Spanish (the non-English language most commonly spoken at home nationwide), Czech was the most-common home language in over a dozen additional counties in Nebraska, Kansas, Texas, North Dakota and Minnesota. As of 2009, 70,500 Americans spoke Czech as their first language (49th place nationwide, behind Turkish and ahead of Swedish). The modern written standard is directly based on the standardization during the Czech National Revival in the 1830s, significantly influenced by Josef Jungmann's Czech–German dictionary published during 1834–1839. Jungmann used vocabulary of the Bible of Kralice (1579–1613) period and of the language used by his contemporaries. He borrowed words not present in Czech from other Slavic languages or created neologisms. Standard Czech contains ten basic vowel phonemes, and three more found only in loanwords. They are /a/, /ɛ/, /ɪ/, /o/, and /u/, their long counterparts /aː/, /ɛː/, /iː/, /oː/ and /uː/, and three diphthongs, /ou̯/, /au̯/ and /ɛu̯/. The latter two diphthongs and the long /oː/ are exclusive to loanwords. Vowels are never reduced to schwa sounds when unstressed. Each word usually has primary stress on its first syllable, except for enclitics (minor, monosyllabic, unstressed syllables). In all words of more than two syllables, every odd-numbered syllable receives secondary stress. Stress is unrelated to vowel length, and the possibility of stressed short vowels and unstressed long vowels can be confusing to students whose native language combines the features (such as most varieties of English). Voiced consonants with unvoiced counterparts are unvoiced at the end of a word before a pause, and in consonant clusters voicing assimilation occurs, which matches voicing to the following consonant. The unvoiced counterpart of /ɦ/ is /x/. This distinction describes the declension patterns of nouns, which is based on the category of a noun's ending consonant. Hard consonants may not be followed by i or í in writing, or soft ones by y or ý (except in loanwords such as kilogram). Neutral consonants may take either character. Hard consonants are sometimes known as "strong", and soft ones as "weak". "řeka" (river) (help·info)), and is present in Dvořák. In unvoiced environments, /r̝/ is realized as its voiceless allophone [r̝̊]. The consonants /r/ and /l/ can be syllabic, acting as syllable nuclei in place of a vowel. Strč prst skrz krk ("Stick [your] finger through [your] throat") is a well-known Czech tongue twister using only syllabic consonants. Slavic grammar is fusional; its nouns, verbs, and adjectives are inflected by phonological processes to modify their meanings and grammatical functions, and the easily separable affixes characteristic of agglutinative languages are limited. Slavic inflection is complex and pervasive, inflecting for case, gender and number in nouns and tense, aspect, mood, person and subject number and gender in verbs. Parts of speech include adjectives, adverbs, numbers, interrogative words, prepositions, conjunctions and interjections. Adverbs are primarily formed from adjectives by taking the final ý or í of the base form and replacing it with e, ě, or o. Negative statements are formed by adding the affix ne- to the verb of a clause, with one exception: je (he, she or it is) becomes není. Because Czech uses grammatical case to convey word function in a sentence (instead of relying on word order, as English does), its word order is flexible. As a pro-drop language, in Czech an intransitive sentence can consist of only a verb; information about its subject is encoded in the verb. Enclitics (primarily auxiliary verbs and pronouns) must appear in the second syntactic slot of a sentence, after the first stressed unit. The first slot must contain a subject and object, a main form of a verb, an adverb or a conjunction (except for the light conjunctions a, "and", i, "and even" or ale, "but"). Czech syntax has a subject–verb–object sentence structure. In practice, however, word order is flexible and used for topicalization and focus. Although Czech has a periphrastic passive construction (like English), colloquial word-order changes frequently produce the passive voice. For example, to change "Peter killed Paul" to "Paul was killed by Peter" the order of subject and object is inverted: Petr zabil Pavla ("Peter killed Paul") becomes "Paul, Peter killed" (Pavla zabil Petr). Pavla is in the accusative case, the grammatical object (in this case, the victim) of the verb. Pes jí bagetu. – The dog eats the baguette (rather than eating something else). Bagetu jí pes. – The dog eats the baguette (rather than someone else doing so). Pes bagetu jí. – The dog eats the baguette (rather than doing something else to it). In portions of Bohemia (including Prague), questions such as Jí pes bagetu? without an interrogative word (such as co, "what" or kdo, "who") are intoned in a slow rise from low to high, quickly dropping to low on the last word or phrase. Czech: Chc-i navštív-it universit-u, na kter-ou chod-í Jan.
English: I want to visit the university that John attends. Some Czech grammatical texts order the cases differently, grouping the nominative and accusative (and the dative and locative) together because those declension patterns are often identical; this order accommodates learners with experience in other inflected languages, such as Latin or Russian. This order is nominative, accusative, genitive, dative, locative, instrumental and vocative. Some prepositions require the nouns they modify to take a particular case. The cases assigned by each preposition are based on the physical (or metaphorical) direction, or location, conveyed by it. For example, od (from, away from) and z (out of, off) assign the genitive case. Other prepositions take one of several cases, with their meaning dependent on the case; na means "onto" or "for" with the accusative case, but "on" with the locative. Examples of declension patterns (using prepositions) for a few nouns with adjectives follow. Only one plural example is given, since plural declension patterns are similar across genders. Czech: Nes-l js-em krabic-i do dom-u se sv-ým přítel-em. English: I carried the box into the house with my friend. Czech distinguishes three genders—masculine, feminine, and neuter—and the masculine gender is subdivided into animate and inanimate. With few exceptions, feminine nouns in the nominative case end in -a, -e, or consonant; neuter nouns in -o, -e, or -í, and masculine nouns in a consonant. Adjectives agree in gender and animacy (for masculine nouns in the accusative or genitive singular and the nominative plural) with the nouns they modify. The main effect of gender in Czech is the difference in noun and adjective declension, but other effects include past-tense verb endings: for example, dělal (he did, or made); dělala (she did, or made) and dělalo (it did, or made). Nouns are also inflected for number, distinguishing between singular and plural. Typical of a Slavic language, Czech cardinal numbers one through four allow the nouns and adjectives they modify to take any case, but numbers over five place these nouns and adjectives in the genitive case when the entire expression is in nominative or accusative case. The Czech koruna is an example of this feature; it is shown here as the subject of a hypothetical sentence, and declined as genitive for numbers five and up. Numerical words decline for case and, for numbers one and two, for gender. Numbers one through five are shown below as examples, and have some of the most exceptions among Czech numbers. The number one has declension patterns identical to those of the demonstrative pronoun, to. Although Czech's grammatical numbers are singular and plural, several residuals of dual forms remain. Some nouns for paired body parts use a historical dual form to express plural in some cases: ruka (hand)—ruce (nominative); noha (leg)—nohama (instrumental), nohou (genitive/locative); oko (eye)—oči, and ucho (ear)—uši. While two of these nouns are neuter in their singular forms, all plural forms are considered feminine; their gender is relevant to their associated adjectives and verbs. These forms are plural semantically, used for any non-singular count, as in mezi čtyřma očima (face to face, lit. among four eyes). The plural number paradigms of these nouns are actually a mixture of historical dual and plural forms. For example, nohy (legs; nominative/accusative) is a standard plural form of this type of noun. Czech verb conjugation is less complex than noun and adjective declension because it codes for fewer categories. Verbs agree with their subjects in person (first, second or third) and number (singular or plural), and are conjugated for tense (past, present or future). For example, the conjugated verb mluvíme (we speak) is in the present tense and first-person plural; it is distinguished from other conjugations of the infinitive mluvit by its ending, -íme. Typical of Slavic languages, Czech marks its verbs for one of two grammatical aspects: perfective and imperfective. Most verbs are part of inflected aspect pairs—for example, koupit (perfective) and kupovat (imperfective). Although the verbs' meaning is similar, in perfective verbs the action is completed and in imperfective verbs it is ongoing. This is distinct from past and present tense, and any Czech verb of either aspect can be conjugated into any of its three tenses. Aspect describes the state of the action at the time specified by the tense. The verbs of most aspect pairs differ in one of two ways: by prefix or by suffix. In prefix pairs, the perfective verb has an added prefix—for example, the imperfective psát (to write, to be writing) compared with the perfective napsat (to write down, to finish writing). The most common prefixes are na-, o-, po-, s-, u-, vy-, z- and za-. In suffix pairs, a different infinitive ending is added to the perfective stem; for example, the perfective verbs koupit (to buy) and prodat (to sell) have the imperfective forms kupovat and prodávat. Imperfective verbs may undergo further morphology to make other imperfective verbs (iterative and frequentative forms), denoting repeated or regular action. The verb jít (to go) has the iterative form chodit (to go repeatedly) and the frequentative form chodívat (to go regularly). Many verbs have only one aspect, and verbs describing continual states of being—být (to be), chtít (to want), moct (to be able to), ležet (to lie down, to be lying down)—have no perfective form. Conversely, verbs describing immediate states of change—for example, otěhotnět (to become pregnant) and nadchnout se (to become enthusiastic)—have no imperfective aspect. Although Czech's use of present and future tense is largely similar to that of English, the language uses past tense to represent the English present perfect and past perfect; ona běžela could mean she ran, she has run or she had run. In some contexts, Czech's perfective present (which differs from the English present perfect) implies future action; in others, it connotes habitual action. As a result, the language has a proper future tense to minimize ambiguity. The future tense does not involve conjugating the verb describing an action to be undertaken in the future; instead, the future form of být (as shown in the table at left) is placed before the infinitive (for example, budu jíst—"I will eat"). This conjugation is not followed by být itself, so future-oriented expressions involving nouns, adjectives, or prepositions (rather than verbs) omit být. "I will be happy" is translated as Budu šťastný (not Budu být šťastný). The infinitive form ends in t (archaically, ti). It is the form found in dictionaries and the form that follows auxiliary verbs (for example, můžu tě slyšet—"I can hear you"). Czech verbs have three grammatical moods: indicative, imperative and conditional. The imperative mood adds specific endings for each of three person (or number) categories: -Ø/-i/-ej for second-person singular, -te/-ete/-ejte for second-person plural and -me/-eme/-ejme for first-person plural. The conditional mood is formed with a particle after the past-tense verb. This mood indicates possible events, expressed in English as "I would" or "I wish". Czech has one of the most phonemic orthographies of all European languages. Its thirty-one graphemes represent thirty sounds (in most dialects, i and y have the same sound), and it contains only one digraph: ch, which follows h in the alphabet. As a result, some of its characters have been used by phonologists to denote corresponding sounds in other languages. The characters q, w and x appear only in foreign words. The háček (ˇ) is used with certain letters to form new characters: š, ž, and č, as well as ň, ě, ř, ť, and ď (the latter five uncommon outside Czech). The last two letters are sometimes written with a comma above (ʼ, an abbreviated háček) because of their height. The character ó exists only in loanwords and onomatopoeia. Unlike most European languages, Czech distinguishes vowel length; long vowels are indicated by an acute accent or, occasionally with ů, a ring. Long u is usually written ú at the beginning of a word or morpheme (úroda, neúrodný) and ů elsewhere, except for loanwords (skútr) or onomatopoeia (bú). Long vowels and ě are not considered separate letters in the alphabetical order. Czech typographical features not associated with phonetics generally resemble those of most Latin European languages, including English. Proper nouns, honorifics, and the first letters of quotations are capitalized, and punctuation is typical of other Latin European languages. Writing of ordinal numerals is similar to most European languages. The Czech language uses a decimal comma instead of a decimal point. When writing a long number, spaces between every three numbers (e.g. between hundreds and thousands) may be used for better orientation in handwritten texts, but not in decimal places, like in English. The number 1,234,567.8910 may be written as 1234567,8910 or 1 234 567,8910. Ordinal numbers (1st) use a point as in German (1.). In proper noun phrases (except personal names), only the first word is capitalized (Pražský hrad, Prague Castle). The main vernacular of Bohemia is "Common Czech", based on the dialect of the Prague region. Other Bohemian dialects have become marginalized, while Moravian dialects remain more widespread, with a political movement for Moravian linguistic revival active since the 1990s. The main Czech vernacular, spoken primarily in and around Prague but also throughout the country, is known as Common Czech (obecná čeština). This is an academic distinction; most Czechs are unaware of the term or associate it with vernacular (or incorrect) Czech. Compared to standard Czech, Common Czech is characterized by simpler inflection patterns and differences in sound distribution. Common Czech has become ubiquitous in most parts of the Czech Republic since the later 20th century. It is usually defined as an interdialect used in common speech in Bohemia and western parts of Moravia (by about two thirds of all inhabitants of the Czech Republic). Common Czech is not codified, but some of its elements have become adopted in the written standard. Since the second half of the 20th century, Common Czech elements have also been spreading to regions previously unaffected, as a consequence of media influence. Standard Czech is still the norm for politicians, businesspeople and other Czechs in formal situations, but Common Czech is gaining ground in journalism and the mass media. unified instrumental ending -ma in plural: s těma dobrejma lidma, ženama, chlapama, městama (with the good people, women, guys, towns) – stand. : s těmi dobrými lidmi, ženami, chlapy, městy. In essence, this form resembles the form of the dual, which was once a productive form, but now is almost extinct and retained in a lexically specific set of words. In Common Czech the ending became productive again around the 17th century, but used as a substitute for a regular plural form. omitting of the syllabic -l in the masculine ending of past tense verbs: řek (he said), moh (he could), pích (he pricked) – stand. : řekl, mohl, píchl. Apart from the Common Czech vernacular, there remain a variety of other Bohemian dialects, mostly in marginal rural areas. Dialect use began to weaken in the second half of the 20th century, and by the early 1990s regional dialect use was stigmatized, associated with the shrinking lower class and used in literature or other media for comedic effect. Increased travel and media availability to dialect-speaking populations has encouraged them to shift to (or add to their own dialect) standard Czech. Bohemian dialects use a slightly different set of vowel phonemes to standard Czech. The phoneme /ɛː/ is peripheral and is replaced by /iː/, and a second native diphthong /eɪ̯/ occurs, usually in places where standard Czech has /iː/. The Czech dialects spoken in Moravia and Silesia are known as Moravian (moravština). In the Austro-Hungarian Empire, "Bohemian-Moravian-Slovak" was a language citizens could register as speaking (with German, Polish and several others). Of the Czech dialects, only Moravian is distinguished in nationwide surveys by the Czech Statistical Office. As of 2011, 62,908 Czech citizens spoke Moravian as their first language and 45,561 were diglossal (speaking Moravian and standard Czech as first languages). Beginning in the sixteenth century, some varieties of Czech resembled Slovak; the southeastern Moravian dialects, in particular, are sometimes considered dialects of Slovak rather than Czech. These dialects form a continuum between the Czech and Slovak languages, using the same declension patterns for nouns and pronouns and the same verb conjugations as Slovak. Standard Czech: Dej mouku ze mlýna na vozík. Common Czech: Dej mouku ze mlejna na vozejk. Central Moravian: Dé móku ze mléna na vozék. Eastern Moravian: Daj múku ze młýna na vozík. Silesian: Daj muku ze młyna na vozik. Slovak: Daj múku z mlyna na vozík. English: Put the flour from the mill into the cart. Czech and Slovak have been considered mutually intelligible; speakers of either language can communicate with greater ease than those of any other pair of West Slavic languages. Since the 1993 dissolution of Czechoslovakia, mutual intelligibility has declined for younger speakers, probably because Czech speakers now experience less exposure to Slovak and vice versa. In phonetic differences, Czech is characterized by a glottal stop before initial vowels and Slovak by its less-frequent use of long vowels than Czech; however, Slovak has long forms of the consonants r and l when they function as vowels. Phonemic differences between the two languages are generally consistent, typical of two dialects of a language. Grammatically, although Czech (unlike Slovak) has a fully productive vocative case, both languages share a common syntax. One study showed that Czech and Slovak lexicons differed by 80 percent, but this high percentage was found to stem primarily from differing orthographies and slight inconsistencies in morphological formation; Slovak morphology is more regular (when changing from the nominative to the locative case, Praha becomes Praze in Czech and Prahe in Slovak). The two lexicons are generally considered similar, with most differences found in colloquial vocabulary and some scientific terminology. Slovak has slightly more borrowed words than Czech. The similarities between Czech and Slovak led to the languages being considered a single language by a group of 19th-century scholars who called themselves "Czechoslavs" (Čechoslované), believing that the peoples were connected in a way which excluded German Bohemians and (to a lesser extent) Hungarians and other Slavs. During the First Czechoslovak Republic (1918–1938), although "Czechoslovak" was designated as the republic's official language, both Czech and Slovak written standards were used. Standard written Slovak was partially modeled on literary Czech, and Czech was preferred for some official functions in the Slovak half of the republic. Czech influence on Slovak was protested by Slovak scholars, and when Slovakia broke off from Czechoslovakia in 1938 as the Slovak State (which then aligned with Nazi Germany in World War II), literary Slovak was deliberately distanced from Czech. When the Axis powers lost the war and Czechoslovakia reformed, Slovak developed somewhat on its own (with Czech influence); during the Prague Spring of 1968, Slovak gained independence from (and equality with) Czech, due to the transformation of Czechoslovakia from a unitary state to a federation. Since the dissolution of Czechoslovakia in 1993, "Czechoslovak" has referred to improvised pidgins of the languages which have arisen from the decrease in mutual intelligibility. Czech vocabulary derives primarily from Slavic, Baltic and other Indo-European roots. Although most verbs have Balto-Slavic origins, pronouns, prepositions and some verbs have wider, Indo-European roots. Some loanwords have been restructured by folk etymology to resemble native Czech words (hřbitov, "graveyard" and listina, "list"). Most Czech loanwords originated in one of two time periods. Earlier loanwords, primarily from German, Greek and Latin, arrived before the Czech National Revival. More recent loanwords derive primarily from English and French, and also from Hebrew, Arabic and Persian. Many Russian loanwords, principally animal names and naval terms, also exist in Czech. Although older German loanwords were colloquial, recent borrowings from other languages are associated with high culture. During the nineteenth century, words with Greek and Latin roots were rejected in favor of those based on older Czech words and common Slavic roots; "music" is muzyka in Polish and музыка (muzyka) in Russian, but in Czech it is hudba. Some Czech words have been borrowed as loanwords into English and other languages—for example, robot (from robota, "labor") and polka (from polka, "Polish woman" or from "půlka" "half"). Czech: Všichni lidé se rodí svobodní a sobě rovní co do důstojnosti a práv. Jsou nadáni rozumem a svědomím a mají spolu jednat v duchu bratrství. English: "All human beings are born free and equal in dignity and rights. They are endowed with reason and conscience and should act towards one another in a spirit of brotherhood." ^ Hammarström, Harald; Forkel, Robert; Haspelmath, Martin, eds. (2017). "Czech". Glottolog 3.0. Jena, Germany: Max Planck Institute for the Science of Human History. ^ a b "Czech language". www.britannica.com. Encyclopædia Britannica. Retrieved 6 January 2015. ^ Golubović, Jelena; Gooskens, Charlotte (2015). "Mutual intelligibility between West and South Slavic languages". Russian Linguistics. 39 (3): 351–373. doi:10.1007/s11185-015-9150-9. ^ a b c d e Berger, Tilman. "Slovaks in Czechia – Czechs in Slovakia" (PDF). University of Tübingen. Retrieved August 9, 2014. ^ a b "Europeans and Their Languages" (PDF). Eurobarometer. June 2012. Retrieved July 25, 2014. ^ van Parys, Jonathan (2012). "Language knowledge in the European Union". Language Knowledge. Retrieved July 23, 2014. ^ Škrobák, Zdeněk. "Language Policy of Slovak Republic" (PDF). Annual of Language & Politics and Politics of Identity. Retrieved July 26, 2014. ^ Hrouda, Simone J. "Czech Language Programs and Czech as a Heritage Language in the United States" (PDF). University of California, Berkeley. Retrieved July 23, 2014. ^ "Chapter 8: Language" (PDF). Census.gov. 2000. Retrieved July 23, 2014. ^ "Languages of the U.S.A" (PDF). U.S. English. Archived from the original (PDF) on February 20, 2009. Retrieved July 25, 2014. ^ Naughton, James. "CZECH LITERATURE, 1774 TO 1918". Oxford University. Archived from the original on 12 June 2012. Retrieved 25 October 2012. ^ "Psaní i – y po písmenu c". Czech Language Institute. Retrieved 11 August 2014. ^ Short 2009, p. 324. ^ Short 2009, p. 325. ^ Uhlířová, Ludmila. "SLOVOSLED NOMINÁLNÍ SKUPINY". Nový encyklopedický slovník češtiny. Retrieved 18 October 2017. ^ Lukeš, Dominik (2001). "Gramatická terminologie ve vyučování - Terminologie a platonický svět gramatických idejí". DominikLukeš.net. Retrieved August 5, 2014. ^ a b "Map of Czech Dialects". Český statistický úřad (Czech Statistical Office). 2003. Archived from the original on December 1, 2012. Retrieved July 26, 2014. ^ "Tab. 614b Obyvatelstvo podle věku, mateřského jazyka a pohlaví (Population by Age, Mother Tongue, and Gender)" (in Czech). Český statistický úřad (Czech Statistical Office). March 26, 2011. Retrieved July 26, 2014. ^ Šustek, Zbyšek (1998). "Otázka kodifikace spisovného moravského jazyka (The question of codifying a written Moravian language)" (in Czech). University of Tartu. Retrieved July 21, 2014. ^ Short 2009, p. 306. ^ Harper, Douglas. "robot (n.)". Online Etymology Dictionary. Retrieved July 22, 2014. ^ Harper, Douglas. "polka (n.)". Online Etymology Dictionary. Retrieved July 22, 2014. ^ "Všeobecná deklarace lidských prav" (PDF). United Nations Information Centre Prague. United Nations. Archived from the original (PDF) on 2015-04-14. Retrieved July 30, 2014. ^ "The Universal Declaration of Human Rights". United Nations. Archived from the original on December 8, 2014. Retrieved December 10, 2014. Agnew, Hugh LeCaine (1994). Origins of the Czech National Renascence. University of Pittsburgh Press. ISBN 978-0-8229-8549-5. Dankovičová, Jana (1999). "Czech". Handbook of the International Phonetic Association (9th ed.). International Phonetic Association/Cambridge University Press. ISBN 978-0-521-63751-0. Cerna, Iva; Machalek, Jolana (2007). Beginner's Czech. Hippocrene Books. ISBN 978-0-7818-1156-9. Chloupek, Jan; Nekvapil, Jiří (1993). Studies in Functional Stylistics. John Benjamins Publishing Company. ISBN 978-90-272-1545-1. Eckert, Eva (1993). Varieties of Czech: Studies in Czech Sociolinguistics. Editions Rodopi. ISBN 978-90-5183-490-1. Esposito, Anna (2011). Analysis of Verbal and Nonverbal Communication and Enactment: The Processing Issues. Springer Press. ISBN 978-3-642-25774-2. Hajičová, Eva (1986). Prague Studies in Mathematical Linguistics (9th ed.). John Benjamins Publishing. ISBN 978-90-272-1527-7. Harkins, William Edward (1952). A Modern Czech Grammar. King's Crown Press (Columbia University). ISBN 978-0-231-09937-0. Komárek, Miroslav (2012). Dějiny českého jazyka. Brno: Host. ISBN 978-80-7294-591-7. Kortmann, Bernd; van der Auwera, Johan (2011). The Languages and Linguistics of Europe: A Comprehensive Guide (World of Linguistics). Mouton De Gruyter. ISBN 978-3-11-022025-4. Koudela, Břetislav; et al. (1964). Vývoj českého jazyka a dialektologie (in Czech). Československé státní pedagogické nakladatelství. Liberman, Anatoly; Trubetskoi, Nikolai S. (2001). N.S. Trubetzkoy: Studies in General Linguistics and Language Structure. Duke University Press. ISBN 978-0-8223-2299-3. Mann, Stuart Edward (1957). Czech Historical Grammar. Helmut Buske Verlag. ISBN 978-3-87118-261-7. Mathesius, Vilém (2013). A Functional Analysis of Present Day English on a General Linguistic Basis. De Gruyter. ISBN 978-90-279-3077-4. Maxwell, Alexander (2009). Choosing Slovakia: Slavic Hungary, the Czechoslovak Language and Accidental Nationalism. Tauris Academic Studies. ISBN 978-1-84885-074-3. Naughton, James (2005). Czech: An Essential Grammar. Routledge Press. ISBN 978-0-415-28785-2. Pansofia (1993). Pravidla českého pravopisu (in Czech). Ústav pro jazyk český AV ČR. ISBN 978-80-901373-6-3. Piotrowski, Michael (2012). Natural Language Processing for Historical Texts. Morgan & Claypool Publishers. ISBN 978-1-60845-946-9. Qualls, Eduard J. (2012). The Qualls Concise English Grammar. Danaan Press. ISBN 978-1-890000-09-7. Rothstein, Björn; Thieroff, Rolf (2010). Mood in the Languages of Europe. John Benjamins Publishing Company. ISBN 978-90-272-0587-2. Short, David (2009). "Czech and Slovak". In Bernard Comrie (ed.). The World's Major Languages (2nd ed.). Routledge. pp. 305–330. Scheer, Tobias (2004). A Lateral Theory of Phonology: What is CVCV, and why Should it Be?, Part 1. Walter De Gruyter. ISBN 978-3-11-017871-5. Stankiewicz, Edward (1986). The Slavic Languages: Unity in Diversity. Mouton De Gruyter. ISBN 978-3-11-009904-1. Sussex, Rolan; Cubberley, Paul (2011). The Slavic Languages. Cambridge Language Surveys. ISBN 978-0-521-29448-5. Tahal, Karel (2010). A grammar of Czech as a foreign language (PDF). Factum. Wilson, James (2009). Moravians in Prague: A Sociolinguistic Study of Dialect Contact in the Czech. Peter Lang International Academic Publishers. ISBN 978-3-631-58694-5. Wikivoyage has a phrasebook for Czech. For a list of words relating to Czech language, see the Czech language category of words in Wiktionary, the free dictionary. Wikimedia Commons has media related to Czech language. Wikisource has the text of the 1905 New International Encyclopedia article Czech language.